I’ve been reading an odd little book titled Queen Elizabeth in the Garden. A Story of Love, Rivalry, and Spectacular Gardens by Trea Martyn which recounts the political/botanical rivalry between Robert Dudley, the Earl of Leicester and William Cecil, Lord Burghley, to win the favor of Queen Elizabeth I by out-gardening one another. Queen Elizabeth did love her gardens, that is certain, and I suppose lavish landscaping might have been one avenue towards favorite status, but the book also references images of Elizabeth in the garden, some with which I was familiar, others not. This got me thinking about images of other monarchs in their gardens, and wondering about the point of this particular type of projection. We still like to see monarchs, and other leaders (the White House Rose Garden!) in a pastoral setting: why? Is it the age-old mastery of nature thing or just aesthetics? I suppose it matters what they are doing: Queen Elizabeth II seems to enjoy walking around engaging with the roses, while our presidents use them as a mere backdrop for important announcements. 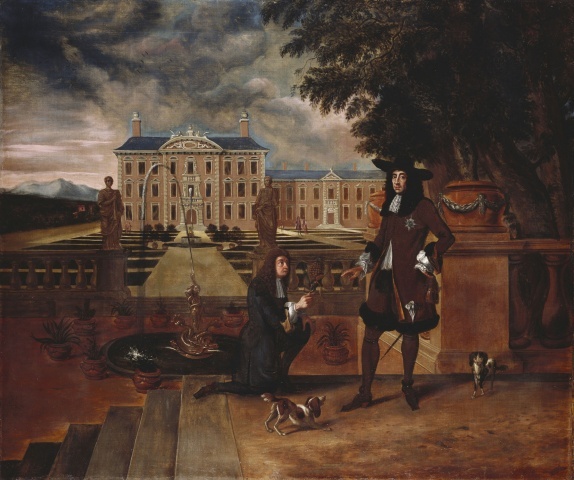 My favorite king-in-the-garden painting is of Charles II accepting a native-grown (but still exotic) pineapple from the royal gardener, John Wise, who is appropriately kneeling as he bears the fruit of his labors. The message seems clear here, but the accessible Charles is clad in the equivalent of “street clothes”, adding interest and intimacy to the painting. 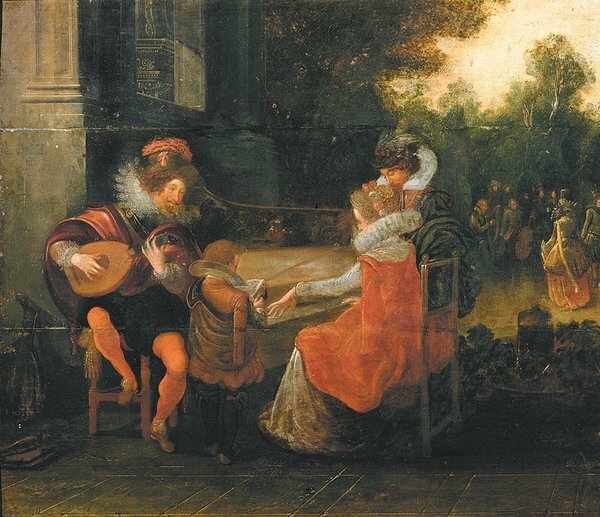 Most likely it was a memorial painting for Wise, who died in the same year it was painted, 1677. 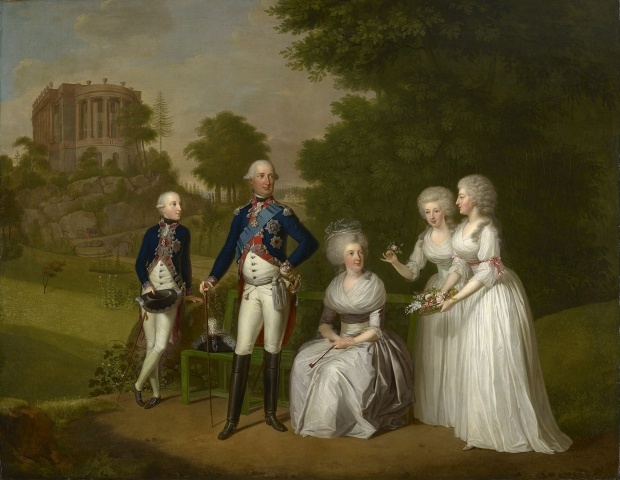 The “pineapple painting”, along with many other examples of horticultural art, is included (conveniently) in the current exhibition at the Queen’s Gallery at Buckingham Palace: Painting Paradise: the Art of the Garden,along with paintings of HR Emperor Elector Wilhelm I and his family in their classical garden (1791) and a the 1897 Jubilee Garden Party with Queen Victoria and Princess Alexandra in attendance. British School, Charles II Presented with a Pineapple, c. 1675-80; Wilhelm Böttner,Wilhelm IX, Landgrave of Hesse-Cassel, later Elector Wilhelm I, his wife, Wilhelmine Caroline and their children, Wilhelm, Friederika and Caroline; Laurits Regner Tuxen, The Garden Party at Buckingham Palace, 28 June 1897, all Royal Collection Trust / © HM Queen Elizabeth II 2015. 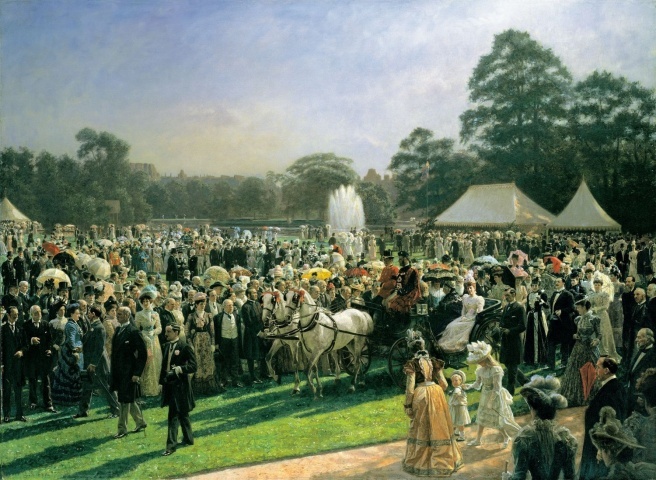 The imperial garden party image could date from this year or last, with updated clothes and Queen Elizabeth II and Duchess Kate standing in for Victoria and Alexandra, even though Great Britain is no longer a true global empire. 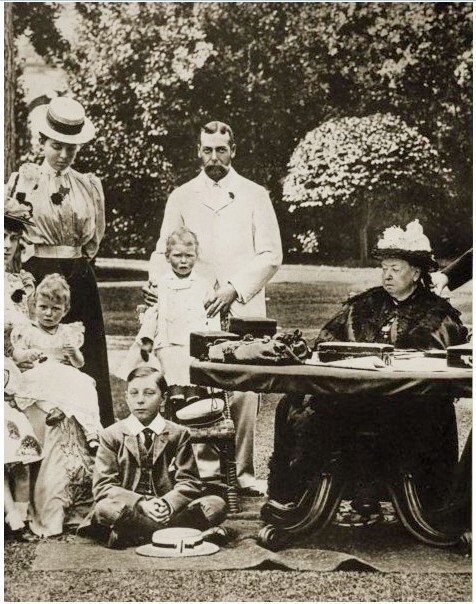 But we would want a close-up, perhaps like that taken of Victoria and her family in the garden of Osborne House a bit earlier. And as for Elizabeth (I), we have two garden paintings which present contrasting images, one featuring a very relaxed queen at Kenilworth (her back to us!) with Leicester and another more formal, symbolic projection of Elizabeth the Peacemaker, olive branch in hand and sword at her feet. In one painting she is in the garden, of the garden, in the other, it serves merely as a backdrop for a working Queen. Detail of a photogravure of Queen Victoria at Osborne House, 1890 (b/w photo), English Photographer, (19th century) / Private Collection / The Stapleton Collection / Bridgeman Images; Dirck Hals, Queen Elizabeth I and the Earl of Leicester at Kenilworth (detail), early seventeenth century, Royal Cornwall Museum; Marcus Gheeraerts the Elder, The Peace Portrait of Elizabeth I (also call The Welbeck or Wanstead Portrait), between 1580-85, private collection. 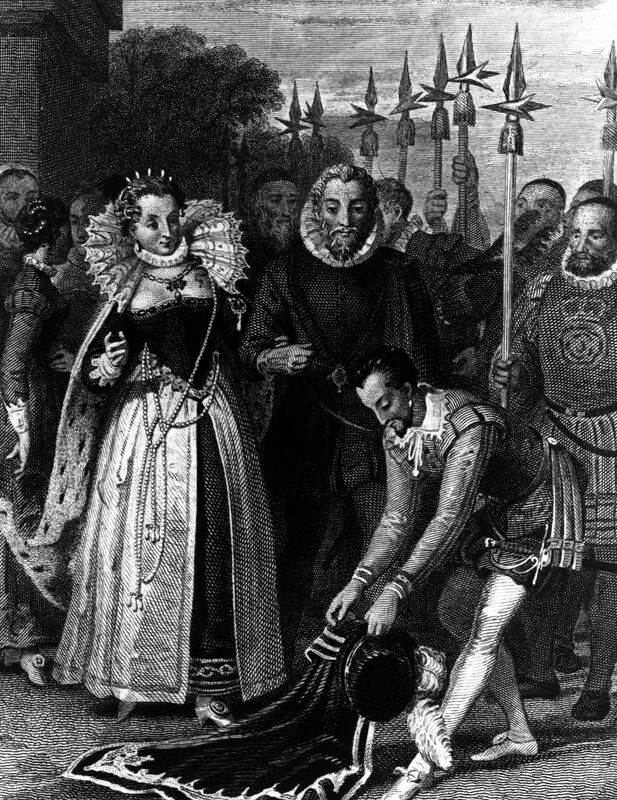 By all accounts he was a charming and handsome man, but how has Sir Walter Ralegh (I’m using the preferred historical spelling), born today in 1552 or 1554, emerged as the most enduring of Queen Elizabeth’s many accomplished courtiers? He was a Renaissance man by our estimation (soldier, explorer, poet, historian, colonizer, seeker of gold) but not of his own time, when you had to do not only a lot of things and look good doing a lot of things, but also succeed at doing a lot of things. 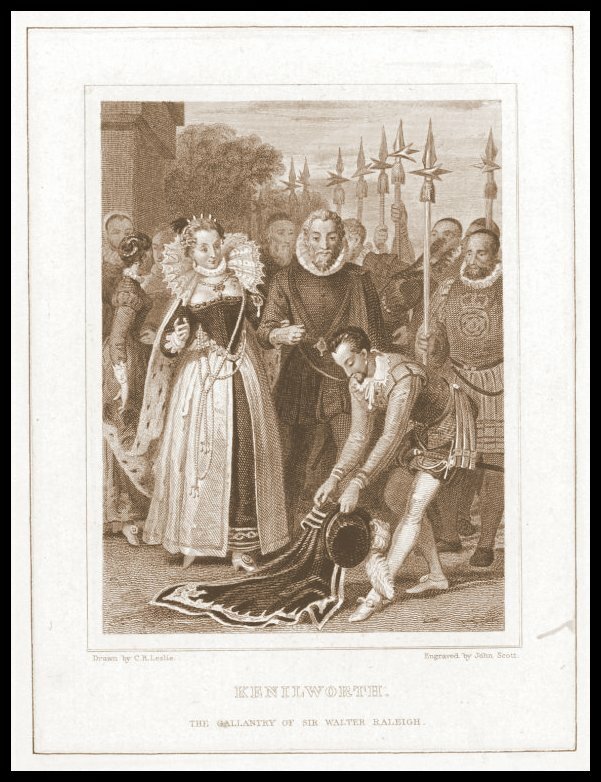 Sir Walter was an erratic explorer, he did not find gold, and his conspiratorial plotting led to his imprisonment and eventual beheading in 1618. His writings, most prominently the Historie of the World, and the Discoverie of Guiana, definitely crafted and sustained his historical reputation as the ultimate dashing Elizabethan adventurer, but I think Ralegh is also the recipient (and the product) of two cultural tendencies: our love for what Tennyson called the many-sided man, and the attention that we pay to anecdotal history. 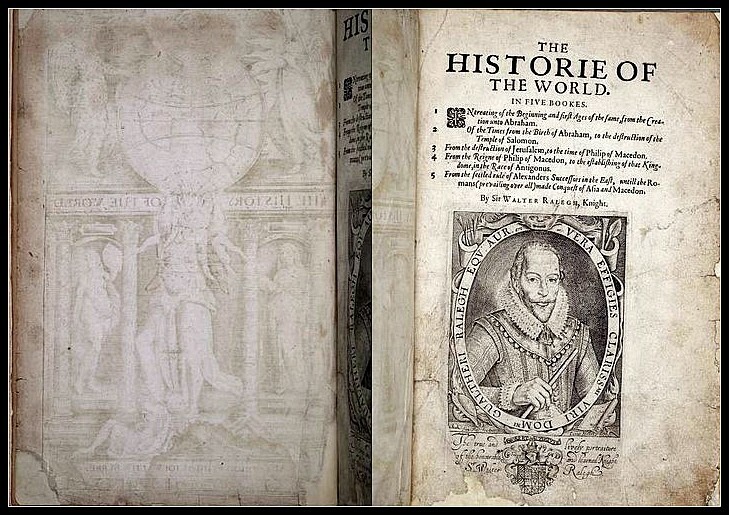 Ralegh’s Historie of the World (1614), and later examples of “Raleighana”: bookplates belonging to T.M Brushfield, St. John’s College, Oxford University–with the Tennyson line— and the University of North Carolina’s Wilson Library, which maintains collections relating to the man “who personified the national ambitions of England in the ‘Age of Discovery'”. Ralegh’s “many sides”, his daring and his intellect, his actions and his words, his strengths and his weaknesses, captured the attention of his contemporaries and held, but I also think that it is the little things that made the man. Anyone who has ever taught history at any level knows the power of the anecdote, and Ralegh’s depicted life is rich with them. 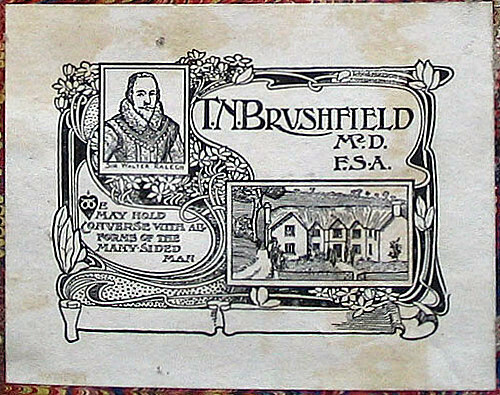 Seventeenth-century sources credit him with introducing two transformative commodities to England: the potato and tobacco. 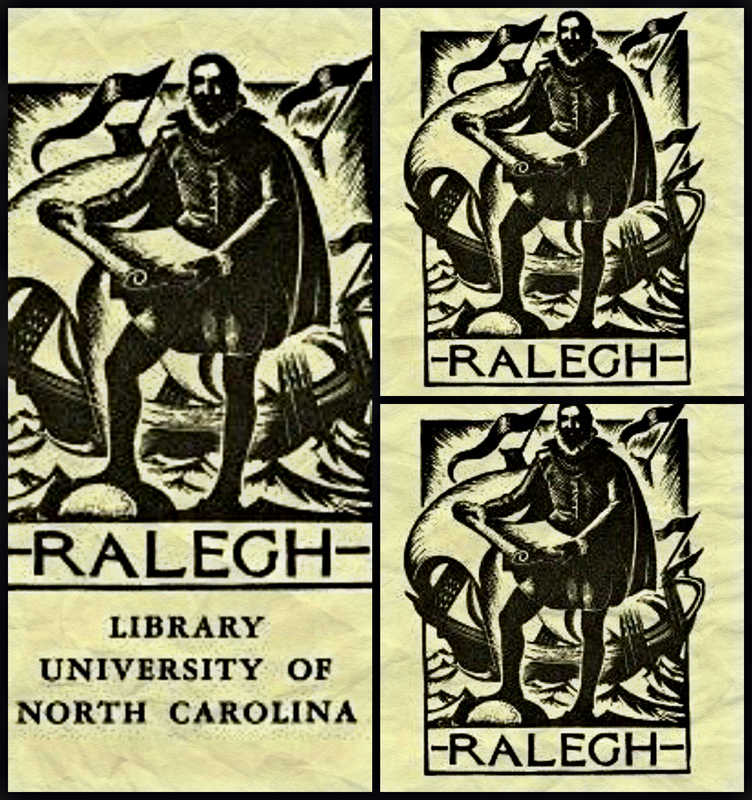 Knowledge of both probably preceded Raleigh, but he is ever-linked to them anyway, particularly the latter: it’s difficult to find an illustration of him from the eighteenth, nineteenth, and twentieth centuries in which he is not in close proximity to smoke. 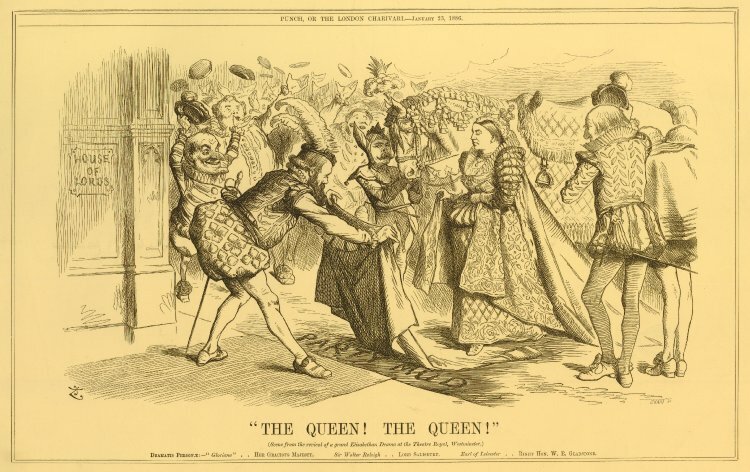 But the characterization of Ralegh as the gallant, who dropped his “plush” cloak on the mud before Queen Elizabeth so that she would not sully her slippers, is even more pervasive/persuasive. Here is the first appearance of this anecdote, in Bishop Thomas Fuller’s gossipy Worthies of England (1662): this captain Raleigh coming out of Ireland to the English court in good habit (his clothes being then a considerable part of his estate) found the Queen walking, till, meeting with a plashy place, she seemed to scruple going thereon. 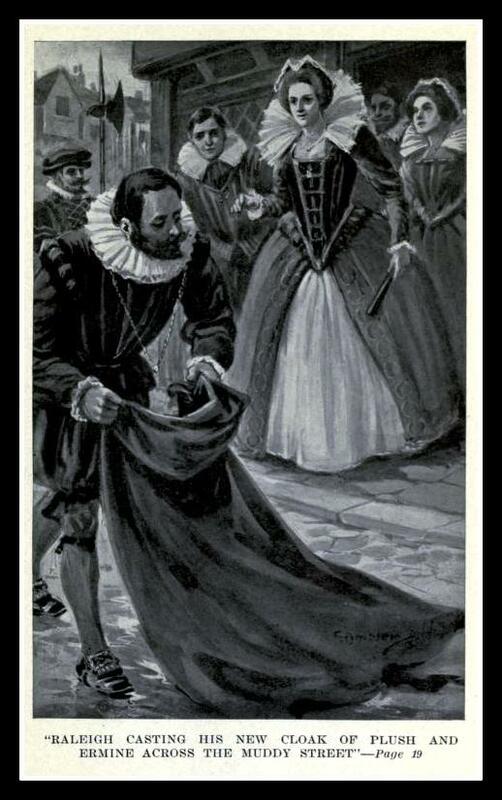 Presently Raleigh cast and spread his new plush cloak on the ground; where the queen trod gently, rewarding him afterwards with many suits, for his so free and seasonable tender of so far a foot cloth. 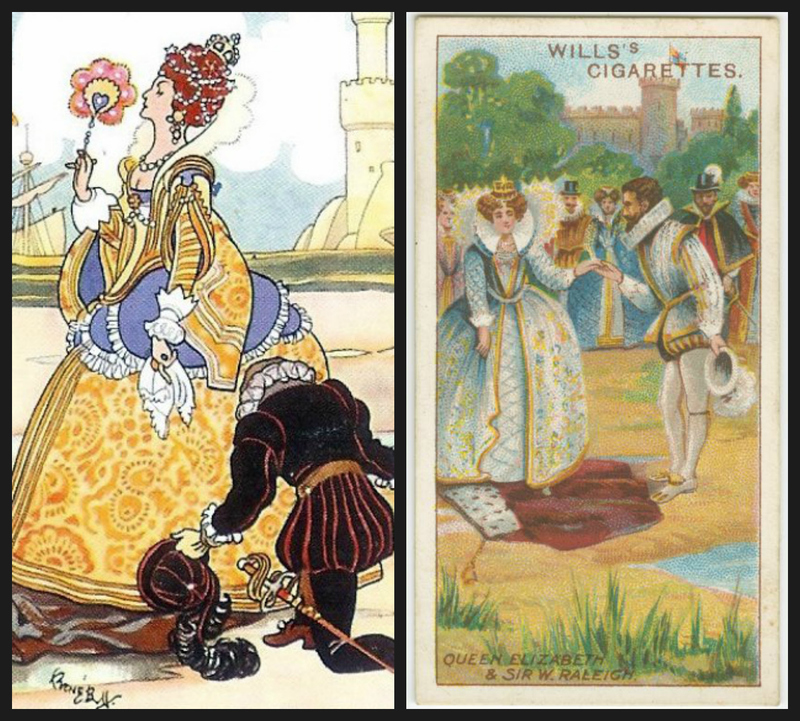 Thus an advantageous admission into the first notice of a prince is more than half a degree to preferment.” Whether this little story is true or not, we will never know, but it hardly matters: the power of repetition and illustration has made it so. 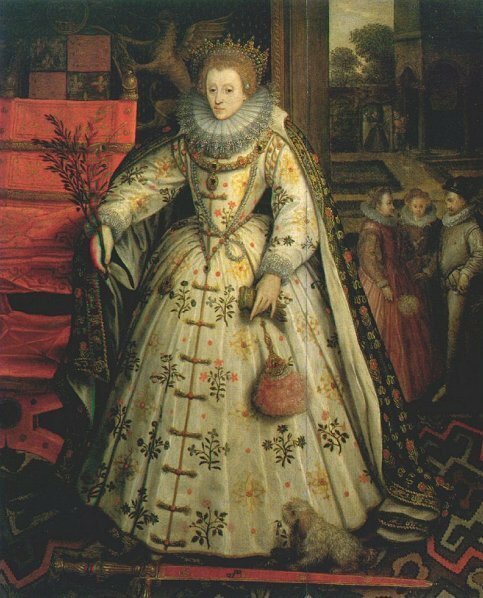 Ralegh did indeed receive many material favors from Queen Elizabeth, but the dramatic rise depicted here was followed but an equally-dramatic fall during the reign of her successor. And that’s another reason why Ralegh endures. 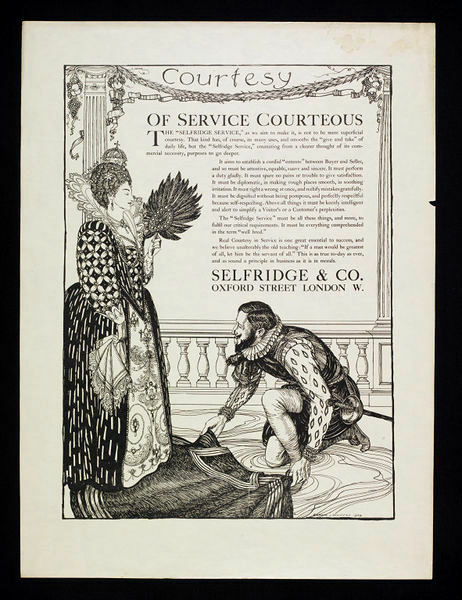 A portfolio of images of Ralegh, his cloak, and the Queen: the iconic event in several editions of Sir Walter Scott’s Kenilworth, New York Public Library Digital Images’ A Victorian variation, 1886, British Museum; an Edwardian advertisement, Victoria & Albert Museum collections; the scene in Beatrice Marshall’s Sir Walter Raleigh, 1914; Churchman’s and Will’s cigarette cards from the 1930s; NYPL Digital Images. Just a sample of a wide assortment!